If you only want to litigate, spend a great deal of time in your lawyer’s office and in court, and spend a lot of money, you are definitely looking for a Divorce Shark. However, there is another type of lawyer: the lawyer who is a creative problem-solver and promotes settling cases reasonably. One of the ways that type of lawyer helps you bring fairness and control to your case is by offering the Collaborative Divorce process as an option. Collaborative Divorces (and Cooperative Divorce methods) allow families to resolve divorce and related family matters in a non-adversarial setting that is more cooperative and friendlier. This process can help families reduce the emotionally and financially draining experience of divorce. It often leads to greater satisfaction for the families, and a reduced likelihood of any future litigation. 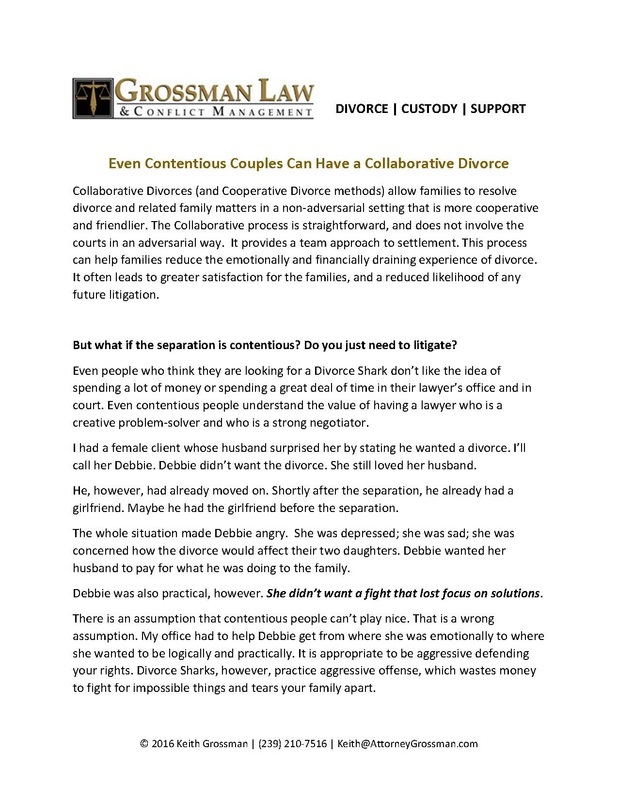 Download our FREE Special Report "Even Contentious Couples Can Have a Collaborative Divorce". This easy-to-read and informative report will help you understand how to avoid the pain and destruction of a typical, litigated divorce.